Get Pricing & Detailed Info- Now- Click Here! Mirror Mirror on the wall…what's the best photo booth of them all? Want to make your event EPIC? 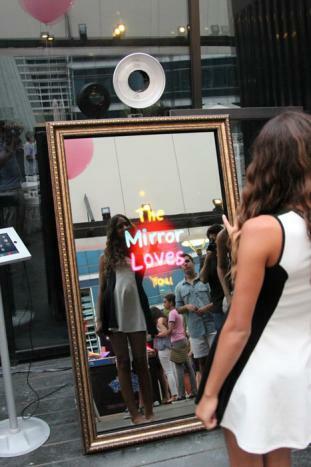 The MAGIC MIRROR is a automated interactive mirror which creates an enjoyable, memorable and interactive brand experience. Hire a mirror photo booth, a new twist on the selfie mirror concept the fully animated mirror not only takes your photos and prints but also has a fun randomised response direct from the 'talking mirror'. After each shot the mirror responds with a fun response both verbally and on screen. Why the Mirror Photo Booth? It’s a totally new concept that you guests will not have seen before! They will LOVE the Magic Mirror. All technology is hidden behind the mirror, enabling users to fully interact and have fun. It really will seem like MAGIC! They will think they are in that big amusement park in Orlando. Wedding Logos, Sweet 16 Logos, event titles & company information can easily be set up and added to the images. The Mirror will print exceptional photos - equipped with the very best SLR cameras & top-quality printers to guarantee top quality prints all the time. The Magic Mirror is fully automated. Which creates an enjoyable, memorable and interactive brand experience. The booth runs cool and professional animations. Your guests can visit as many times as they want for the duration of the event. Very New, Very Cool and Very Exciting! © 2018 Mirror-Booths.co All Rights Reserved.